Use any of the tools in the limited toolbar below to construct this triangle's incircle. You can use the slider to change the measure of angle A at any time. Feel free to move the triangle's white vertices around as well. Feel free to reference this worksheet at any time. Recall that the incenter is the center of a triangle's incircle. Questions: 1) Is it ever possible for a triangle's incenter to lie OUTSIDE the triangle? If so, under what circumstance(s) will this occur? 2) Is it ever possible for a triangle's incenter to lie ON THE TRIANGLE ITSELF? If so, under what circumstance(s) will this occur? 3) If your answer for (2) was "YES", where on the triangle did the incenter lie? 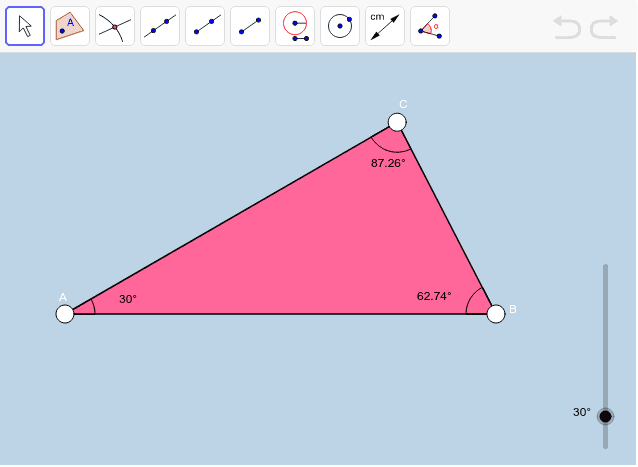 Use the tools of GeoGebra to validate your response. 4) Is it ever possible for a triangle's incenter to lie INSIDE the triangle? If so, under what circumstance(s) will this occur?